And, it’s enough for litigators to realize that Twitter, with a whopping 310 million monthly users, like other social media sites, makes up an important market. From safety to theft to libel, social media is hotbed of lawsuits. Just today it was announced that social media mogul Mark Zuckerberg’s Twitter and Pinterest pages were compromised after a hacker or hacking group named “OurMine Team” temporarily pirated Facebook founder Mark Zuckerberg’s accounts. LinkedIn settled a consolidated class action lawsuit stemming from a June 2012 data breach that compromised 6.5 million hashed passwords in 2014, for which we can only assume Zuckerberg was victim. It has since been required to implement data security protocols using the industry standard encryption methods of salting and hashing for at least five years. This is not the first time Twitter has made the news (or the docket). Back in 2009, Amanda Bonnen took part in the first ever twitter-related lawsuit. In it, Horizon Realty Group contended that Bonnen defamed Horizon by tweeting to her friends about the apartment she rented from them, “You should just come anyway. Who said sleeping in a moldy apartment was bad for you? Horizon realty thinks it’s ok.” Horizon alleged this was libel and demanded at least $50,000. Eventually Horizon’s suit was dismissed on the grounds the tweet was too vague to meet the definition of libel. Since then, tweets have made up a major concern for companies. Reputation and revenue are on the line in 40 characters or less. Unfortunately for the food chain, U.S. Labor Laws protect employees’ rights to free speech, and a Philadelphia judge ruled that Chipotle needed to rehire Kennedy—with back pay. Employees’ social media activities frequently play an important role in workplace investigations. Yet, when investigating harassment, discrimination or other employee-related claims employers must be aware of specific laws that restrict employers’ requests (and access to) an employee’s social media accounts and posts. Fifteen states have passed laws that limit the employer’s authority over employees’ social media accounts, and many more are not far behind. No matter how serious the investigation, one peek at an employee’s social media account could become a costly, non-compliance nightmare. If your firm doesn’t already know best practice solutions for conducting workplace investigations legally and effectively, now is the time. What employee conduct the National Labor Relations Board (NLRB) protects and the finer points of the guidelines it has provided. And afterward, go ahead and tweet about it. You’re covered. Twitter may well become the Internet’s next online shopping platform. For the first time, a “Buy now” button appeared on multiple tweets this month, all of which included products that link back to a shopping site called Fancy, reports Mashable. The button only appears on Twitter’s mobile site, not its web version, and the company itself has yet to comment. But, allowing this sort of third-party link to shopping services isn’t at all that surprising. “A law firm could develop landing pages for ‘simple legal services’ at flat fees and run ‘Buy Now’ ads on Twitter. The Twitter ad schema would enable ultra focused ads to reach locales and various demographic groups,” writes Kevin O’Keefe on a Real Lawyers Have Blogs post. Sound farfetched? Not really. It’s already happening. “I would never have dreamed lawyers would buy pre-written blog posts, sell a half hour of their time for $50 per hour on an a legal matching site, sell services via Groupon, or pay $90 per click through on Google Adwords,” admits O’Keefe. But law firms do, and have. Even if Twitter doesn’t rollout this new service, there are plenty of other reasons law firms should use social media. Law firms, LexisNexis, and client management solution providers are just a few of the many legal services groups taking advantage of Twitter. LexisNexis does a great job at using Twitter to build relationships and enhance their visibility and reputation among customers. LexisNexis has over 26 thousand followers on Twitter. And there’s no wonder why. Its posts are readable, interesting, and we’re all vying to be their next re-tweet. “I feel an enhanced relationship with the companies and their executives. I am more apt to speak positively about the companies and their work—when deserved. I begin to tweet things they blog or share on Twitter. I am more apt to reach out to the companies on ideas. The last reason being no small thing. Read more about how to use Twitter effectively as a law firm or legal services entity on O’Keefe’s Real Lawyers Have Blogs. Twitter is just one social media tool of many. And even if you would never do the same, if you consider it nearly unbelievable, as many as 56 percent of consumers and 72 percent of minorities who searched for an attorney in the past year reported doing so via social media, according to a study conducted by The Research Intelligence Group. In fact, over one-fifth of survey participants went so far as to consult the social media pages of the specific lawyers or firms that they were considering during this search for legal representation. So whether or not shoppable tweets are on their way, there’s already more than one reason for law firms to use Twitter. How can you maximize the potential of social media while ensuring the appropriate use of intellectual property and customer information? What can counsel do to proactively protect brands from infringement by social networking website users? This Spring, Tumblr hit the 100 Million mark—100 million blogs, that is. If we’re talking about numbers in terms of profit, Tumblr far exceeded mere millions. In May, social blogging platform CEO David Karp sold the company to Yahoo! for a cool $1.1 billion. Karp, for those who don’t already know, is a 26-year old high school drop out who built Tumblr while still living at his mother’s New York City apartment in 2007, writes Brian Warner for Celebrity Net Worth. In the same period it can take lawyers to settle a single lawsuit, Karp created and sold a billion-dollar business. If there was ever a time to praise the popularity of social media, Tumblr’s milestone in millions of blogs could certainly serve that purpose. That’s why it’s not surprising to read in a recent study conducted by The Research Intelligence Group that 56 percent of consumers and 72 percent of minorities who searched for an attorney in the past year reported doing so via social media. In fact, over one-fifth of survey participants went so far as to consult the social media pages of the specific lawyers or firms that they were considering during this search for legal representation, reports Kevin O’Keefe for Real Lawyers Have Blogs. Law is a time-honored profession. As such, it maintains certain traditions and history. Ergo, lawyers aren’t often known for being on the cutting edge of technology. Nevertheless, most law firms today have a website. Keeping that website up-to-date is critical. Firm websites help you attract more clients, rise in search engine rankings, keep up with technological developments for electronic legal tools, update your firm and practice area information, and increase interaction with the legal community and community of potential clients, in general. Thus, with proper disclaimers, your firm can join the Twittersphere. In the end, websites, blogs, Twitter, and other social media are not a new development in technology. The Research Intelligence Group’s survey shows that although the number of Internet users declined with age, a surprising 30 percent of survey respondents above the age of 50 were also professed social media users. And, among survey respondents, nearly one-quarter made a final selection of a lawyer based, in part, on what they gleaned through their social media research, according to Kevin O’Keefe for Real Lawyers Have Blogs. So, what are a few “must-haves” for attorney websites? Areas of Law Practiced. Specify your areas of legal expertise and the services that you offer in each of those areas. If visitors can’t find this information quickly, or if it’s unclear, they are likely to leave the site. Experience. Prospective clients want to know how long you have practiced law and whether you have previously handled cases like theirs. Education. Reassure visitors that you have the know-how to resolve their legal issues. Tell them where you went to law school, and when and where you passed the bar exam. Photos. Offer a glimpse of your personality through pictures, but remember to always use professional-looking shots. People who visit your site are searching for an attorney they can trust, not a drinking buddy. However, training your team in technology serves your clients in more ways than one. In today’s Facebook world, lawyers use social media to attract clients, but they can also have an obligation to perform research on social media sites during investigations, as well. Social media profiles are a potential treasure trove of information in litigation. But using social networking can ensnare attorneys in ethical traps in two different ways: (1) when accessing information in someone else’s profile, and (2) when an attorney’s own profile information might be used against them. How can you effectively use social networks to gather information to gain a legal edge while ethically keeping out of trouble? C4CM’s comprehensive webinar, Using Social Media in Legal Investigations: Traversing the Ethical Minefieldon July 16, 2013, from 2:00 P.M to 3:15 P.M. Eastern time, explores key strategies to improve your legal investigation on social media while keeping yourself safe from legal and ethical pitfalls. If you’ve found this blog post via social media, you’re off to a great start. Keep up the momentum by exploring other important online tools for law firm managers here. With so many consumers consulting social media, it’s time for law firm professionals to (*ah hem*) follow suit. Almost a month after the iPhone 5 was released, customers remain impressed with the numerous upgrades to the phone’s touch screen, light weight, and high speed. But, even such a well-received product has its flaws. For example, critics instantly seized the opportunity to censure Apple’s foray in the navigation app market—iMaps. The search function is too complicated, locations flat-out wrong, and typos abound in place names. Critics have also complained about wifi issues, excessive scratching on the back of certain models, and confusion over Passbook and other Apple apps. Nevertheless, Apple iPhone 5 demand remains high ands its reception warm. Both tech analysts and the general public have welcomed this new phone with open arms and willing fingers. Why? There’s no such thing as the perfect product or service. But, with proper updates and maintenance—like Apple iPhones have shown over time—companies (and law firms) can come close. With this in mind, law firm managers should seriously consider the following six reasons for why it’s important to update your business website. If your Fall is feeling blue (not green), a change in your website may be just what you need to add some color to the firm’s billable-hour tree. These days, legal services are found via the world wide web. Your firm’s website—specifically your home page—is akin to a first meeting with a new client. The first impression your site imparts should embody your work style and attitude. For former or return clients, a stagnant website sends the message that your firm’s practice might be too. Instead, send the message that your firm is modern, up-to-date, and tech savvy. Before he closes his browser, a client should feel as satisfied and confident with your legal services simply by perusing your website as if he had just been welcomed through the office door. Another reason to ramp up your website is to rise in search engine index rankings. Basically, when a person types into Goolge, “Best patent lawyer in San Francisco,” Google searches through a giant index for the most relevant webpages. If you are a patent attorney in or around San Francisco, you want your website among them. Believe it or not, there’s actually a way to increase your ranking on this mysterious webpage index and a method for achieving better results. It’s called, Search Engine Optimization or SEO. Your website designer is surely aware of this skill. And, it’s time to improve your Internet visibility. Update your website to include the keywords, phrases, meta-tags, and HTML necessary to get you noticed. These search engine indexes are constantly changing and reshuffling their content. So, why aren’t you? When a professional service, like the field of law, brags about their ability and knowledge of technology today, the easiest way to verify this claim is by vetting their website. It’s not just about first impressions. Beautiful, functional, and useful websites are also about credibility. In the 21st century, a firm’s ability to deliver high-quality, high-value services depends on its ability to master and apply new technology. Consistently updating your website implies to clients that your law firm is constantly ready at the helm. Update your business look with a new look on your website. Did your law firm add a name partner? Did admin take high-res photos of your associates? Would you love to tout the legal expertise of a new hire? Whether it’s a new logo or a new lawyer, keep your website as up-to-date as your know-how. Firm managers shouldn’t forget they’re running a legal business in addition to changing legislative bills. Law is an interactive industry. It requires constant communication. That’s why updating your website to include social media—blog links, Twitter, Google +, Facebook, etc.—will help your attorneys keep in touch with their clients. It will also help your clients feel in touch with you. You don’t have to publicize your cell phone number to make a client feel like they know who you are and trust your competency. All it takes is a photo of your warm smile on the online directory or a quick “Message from the partners” bannered on the homepage to improve the working relationship you have with both clients and colleagues. Finally, since communication is a two-way street, add an area for comments and feedback. Corporate clients are full of untapped resources and industry knowledge. Invite all website visitors to share their stories, opinions, and better-business suggestions with your management team. After all these changes to your website, you may realize that’s not all your firm needs. Although many legal consulting companies advise law firms to make good use of free and accessible social media, such as Twitter, blogging, or social network sites. Some consider the practice to be more of a trap than trail to success. His article is full of sound professional advice, including, don’t talk about or to clients over social media, beware of the marketing-related Rules of Professional Conduct when writing online, and don’t give legal advice over the Internet. In some sense, it’s common sense. Of course, it’s natural to keep aware of conflicts of interest and to not engage in the unauthorized practice of law. Still, something about the anonymity of digital makes people forget about these daily professional conduct rules. Also, the more software and technology used by your firm, the more necessary tools for confidentiality and protection, like an excellent IT Department, becomes. Employees at your firm should properly secure its wireless network; update its antivirus software and build a firewall; and remember to remove metadata or password protect-sensitive email attachments. But, are these risks—inherent in any online activity—so severe that they outweigh the benefits of using social media? “Is fashion attorney Staci Riordan, perhaps the fastest woman associate to make equity partner at Fox Rothschild, a century old national law firm, advertising with her heavy use of Facebook and Twitter?” questions Kevin O’Keefe in his article “Is all use of social media subject to legal ethics rules?” on his blog. The question seems rhetorical. And O’Keefe, author of Real Lawyers Have Blogs, believes social media is not about advertising, rather, it’s about building a conversation of trust between lawyers and their clients. “Riordan, like many shrewd lawyers who truly understand relationships and reputation aren’t built by having separate online identities, uses Twitter and Facebook to network and engage with business leaders, other lawyers, civic leaders, and friends. Riordan knows networking to nurture relationships and establish trust with others so as to build a strong word of mouth reputation is the stuff life is made of for lawyers looking to grow their business and become better lawyers,” he writes. Ultimately—like any great rivalry—O’Keefe and Watson want the same thing. Both men want to watch the industry of law regain some of the reputation of honor and integrity it has lost over the years. And, both are eager to influence and advance their struggling profession. As lawyer jokes become commonplace and the information highway makes pro se (and in-house) representation all that more accessible to Americans, law firms are seeking new outlets and tools for survival. Using social media to keep up with the times has its risks. But, so does not using it. Embrace innovation. If your firm still has concerns, consider hiring a consultant to guide you into the 21st century instead of driving you astray. According to a survey of social media in the legal sector by LexisNexis and Vizibility, 81 percent of lawyers claim that they already use social media as marketing tools. 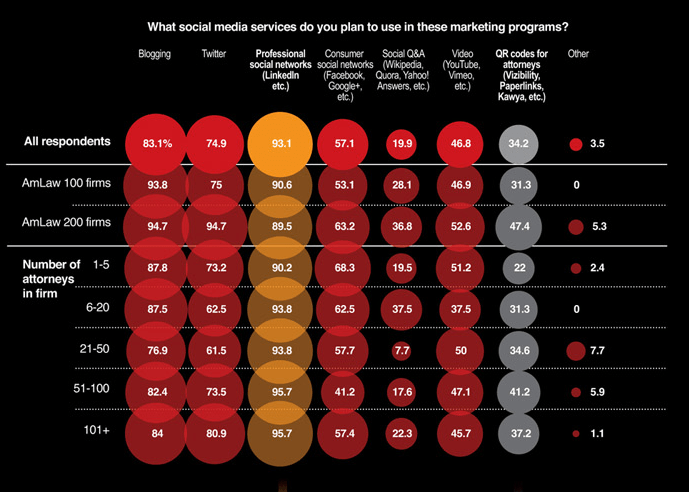 Another 10.1 percent saying they plan to deploy social media marketing elements within six months. Only 12 percent of lawyers do not use a Blackberry, iPhone, Android, or other smartphone in their business. For everybody else, there are these top 10 apps for Android phone and iPhone users. And, as of today, U.K. lawyers can now find LexisNexis apps for their iPhone and iPad. Both apps are free to subscribers of Lexis®Library and can be accessed with current customer ID and passwords. Kevin O’Keefe wrote an article about Lexis’ announcement, and also attached a PowerPoint from Dr. Corrine Weisberger of St. Edward’s University to his article, which discusses using Twitter as a public relations’ tool. You can find the PPT here. Although law firms and legal services professionals are finally employing social media and blogging to advance their businesses, these firms are still lacking in a consistent social media policy. Take, for example, Kevin O’Keefe’s complaint about the Lexis press release today. In an attempt to “spread the word” about Lexis’ apps, Kevin O’Keefe attempted to locate the Twitter handle of the press release’s author, Melissa Higgs. “I couldn’t find Higgs Twitter handle. Nothing on a general Google search except for a Melissa Higgs, also in the UK, who says her tweets are personal. No one by the name of Melissa Higgs on Twitter who says they are working for LexisNexis. Not seeing any tweets referencing LexisNexis from folks by the name of ‘Melissa Higgs’ on Twitter, I didn’t want to give an incorrect attribution by guessing. I went to Higgs LinkedIn profile, where most folks include their Twitter handles. Nothing,” writes O’Keefe. Unsurprisingly, in the same survey of social media in the legal sector by LexisNexis and Vizibility, when asked, “Does your firm have a social media policy or guidelines for social media,” only 61.2 percent of legal professionals responded yes. LexisNexis will surely benefit from its iPhone and iPad apps, but it’s currently losing out from not advertising these apps via Twitter, among other Internet conduits. 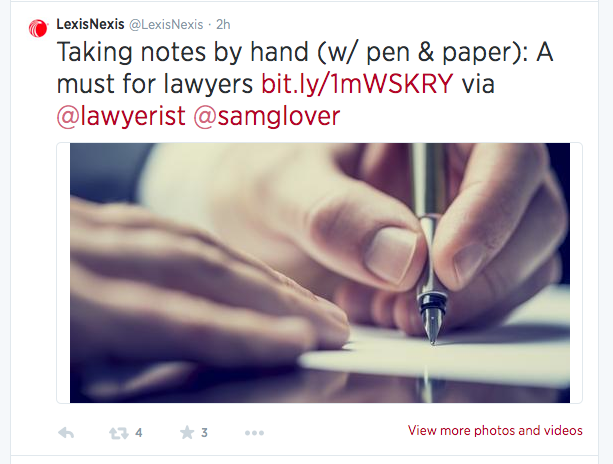 LexisNexis needs a policy that streamlines the company’s use of social media for marketing. So where should they start? 1. Formulate a strategy. Many firms are stymied when it comes to creating a social media strategy. These days, companies (like this one) are available to walk you through the process. For “do it yourself” firms, come up with a game plan and series of goals for your social media use—is it for client education, employee recruitment, or PR? Then, circulate this strategy to your firm’s appropriate department. 2. Implement guidelines. Social media policies should explain to associates expectations for their participation on sites, such as LinkedIn, Facebook, or Twitter. It should also create guidelines for the firm’s social media use: How often will the firm post, who is responsible for posting, and how will all your social media systems correspond with one another (see O’Keefe’s point about trying to locate a Twitter handle via LinkedIn). 3. Encourage associates to use social media. As the aforementioned survey details, social media has infiltrated the legal profession. Used as a marketing strategy, firms benefit from having their name saturating the digital world. Encourage your associates to belong to these networking sites. Or, to blog about their experience with the firm. Had Lexis done encouraged social media use among its employees, Melissa Higgs would likely be on Twitter. The Internet is undoubtedly the first place that prospective clients and new employees will look to be introduced to your firm. To conclude, ensure the name of your firm—and its services—is always linked with descriptions like “innovative” and “cutting-edge” by making better use of technology and social media, and implementing a policy to protect your corresponding online reputation. If you’re reading this blog, you’re not alone. The legal profession, it turns out, is becoming inundated with law blogs. It only takes a quick Google search to realize all your major competitors have a blog for their firm. According to a recently-released survey of social media in the legal sector by LexisNexis and Vizibility, 81 percent of survey participants reporting they already use social media marketing tools and another 10.1 percent saying they plan to deploy social media marketing elements within six months. With so much interest and activity flurries within the legal blogging world, you may be surprised to find that this new industry is still fairly unstructured. When asked, “Does your firm have a social media policy or guidelines for social media,” however, only 61.2 percent of legal professionals responded yes. And, a small niche of lawyers continues to rebuff smartphones in 2011. At least 12 percent do not use a Blackberry, iPhone, Android, or other smartphone in their business, including scanning QR codes. So, to those 30.8 percent of legal professionals who find social media to be extremely important to their firm’s overall marketing strategy (and the 48.8 percent who admit it’s somewhat important), here are three ways to propel your firm forward into the world wide web of successful social media users and profiteers. It’s a legitimate and smart step toward success to start a blog for your law firm. However, what next? Many firms are stymied when it comes to creating a social media strategy. These days, companies (like this one) are available to walk you through the process. Or, for “do it yourself” firms, come up with a game plan and series of goals for your social media use. Is the primary purpose recruitment? If so, gear your law firm articles toward law school students. Have your first-year associates control the content to keep it pertinent to the generation. Is the main goal of your blog to attract new clients? If so, perhaps a managing partner or firm administrator should be the major contributor. Write about key case wins and other newsworthy successes. Add interesting profiles and photos of your most promising attorneys to garner attention from the outside world seeking counsel. Allow third-parties to subscribe to your blog or newsletter, and aim its content toward business ideas or legal developments that would be of interest to your prospective clients and also ones that will show off your firm’s expertise. Not only should your firm create a social media strategy, but it should also write a social media policy. Social media policies should explain to associates expectations for their participation on sites, such as LinkedIn, Facebook, or Twitter. What is your stance on associates having personal blogs? There’s nothing to stop free speech in this country, but you can certainly address for associates how your firm would like its image to be portrayed on the Internet. As the aforementioned survey details, social media has infiltrated the legal profession. Used as a marketing strategy, firms benefit from having their name saturating the digital world. Encourage your associates to belong to these networking sites. Or, to blog about their experience with the firm. The Internet is undoubtedly the first place that prospective clients and new employees will look to be introduced to your firm. Don’t keep your acclaim or successes a secret. If your firm is part of the 19 percent who have yet to use social media as a marketing tool, it’s not too late to start today.